Weaving is my vehicle to investigate what it means to be a human being influenced by the natural landscape and beauty of the earth. Weaving is one of those original crafts that has been practiced by almost every culture on our planet. It is part of our fundamental human cultural inheritance and as such, touches a place of deep knowing in us all. 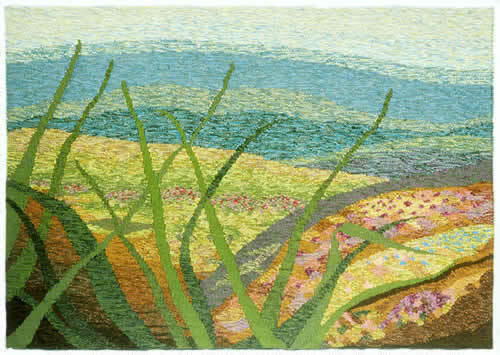 My work represents a lifelong love of the natural environment. It is an exploration of the forces or energies that move through everything on and beyond the planet. It is a meditation. Light is an important element and source of inspiration. I try to communicate a sense of harmony and movement in the universe. In Mayan culture weaving is one of the sacred paths of shamanism. Weaving has its own rythm or energy - the energy of balance or harmony. Working on the loom alternately from left to right, and then from right to left, literally has a balancing effect on right-and-left-brain functioning. The ancient Mayans understood this and channelled this weaving energy into sacred symbols for protection, fertility, safe journey, etc. woven into their cloth and clothing. These symbols and repeated weaving patterns become the "text" of textiles. Weaving has a gentle humanizing effect on both weaver and viewer alike. Beautifully dyed and woven yarns radiate warmth and intimacy. Tapestry weave is actually one of the simplest of all weaving techniques. Using my own adaptation of both gobelin and pre-columbian techniques. I have developed an approach that demystifies weaving to make it accessible for anyone. I am told that my teaching is inspirational and freeing.